LIMA, Ohio (May 28, 2010) – Luke Hall led all 25 laps of the Engine Pro ASCS Sprints on Dirt presented by ARP main event at Limaland Motorsports Park Friday night in front of a large crowd on a summer-like evening to kick off the three day co-sanctioned swing through Ohio with NRA, but it wasn’t easy. Starting from the front row, Hall gunned into the lead at the outset with fellow front row starter Jeff Williams falling in line second with Tim Hunter, J.R. Stewart and Kyle Sauder in tow with five laps in. Butch Schroeder was quickly making up ground after starting 13th and by lap eleven had moved into fifth. Lap eleven saw the red flag appear for a two car flip on the front stretch involving Tim Hunter and John Kettlewell. Both drivers were uninjured. When the green came back out the running order was Hall, Williams, Sauder, Stewart, Tim Allison on the prowl from 17th and Mike Dussel. At the 20-lap mark things were getting dicey with several cars making a charge towards the front. Hall was still leading but Sauder, Stewart, Schroeder and Dussel had their sights on Hall’s No. 34. As the white appeared, Stewart was charging around the bottom side and coming out of turn four it looked as if he would make the pass, but Luke Hall was up to the task and held on for the victory. Heats for the outstanding 42-car field were won by J.R. Stewart, Kent Wolters, Kyle Sauder and Tim Hunter. The first B main went to Tim Allison while Todd Heuerman captured the second B main. The #26 of Rodney Hurst brought out the red in the second B after riding the turn four wall and turning over. He was ok.
Engine Pro ASCS Sprints on Dirt presented by ARP Point Standings (Top Ten): 1. Ben Rutan 257, 2. (tie) Gregg Dalman and Ryan Ruhl 252, 4. Dain Naida 246, 5. Ryan Grubaugh 222, 6. Gavin Hunyady 216, 7. Robert Huisken 215, 8. Dustin Daggett 150, 9. Darren Long 142, 10. Joe Bares 135. The Engine Pro ASCS Sprints on Dirt presented by ARP event scheduled for Friday May 21st, 2010 at Gas City I-69 Speedway was rained out. The next event for the tour will be the first of a three night stand in Ohio co-sanctioned by the National Racing Alliance at Limaland Motorsports Park on Friday May 28th. Steve Kaminski named Dustin Daggett as one of the featured five Michigan drivers for this past week. Daggett was singled out for winning the season opening feature at Crystal Motor Speedway on Saturday, his 11th win in his last 12 starts at Crystal. Click continue reading to view the entire story. Tim Champlin collected pass master honors during the season opener for the Engine Pro ASCS Sprints on Dirt presented by ARP by passing the most cars during the feature event. Champlin advanced from 19th starting position to finish 9th in the A-Main. The driver passing the most cars from their original starting position during all of the feature events this season will collect a prize at the season ending awards banquet courtesy of JE / SRP Pistons. 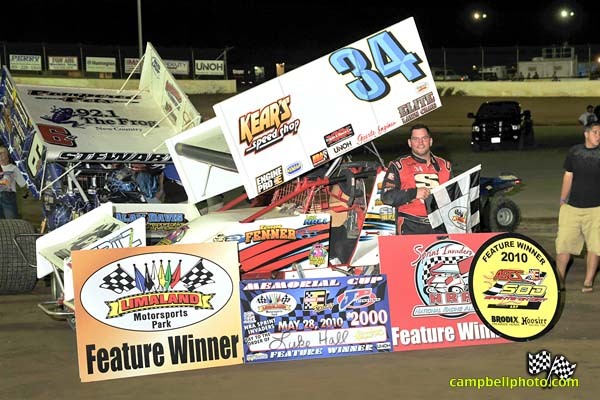 In the season long chase for the Engine Pro ASCS Sprints on Dirt presented by ARP championship and the SOD Cup Dustin Daggett used his feature victory Saturday at Crystal Motor Speedway to vault to the top of the standings. Daggett will lead the points going into the second event of 2010 at Gas City I-69 Speedway.